"How can somebody be so educated? How could somebody have brought themselves up from their own experience and gone to the top—educated herself, fought for rights, civil rights, and equality?" 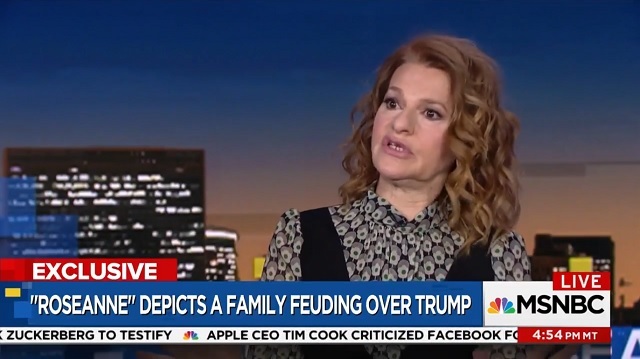 "Roseanne" actress Sandra Bernhard went on a hate-filled rant against white women Wednesday on MSNBC. Asked by host Ari Melber why she thinks white women voted Trump, Berhard said, "I think it's a couple of issues." "It's being either under the thumb of your husband or, for the election, it was being so offended by Hillary Clinton and Bill Clinton's legacy that you turned on her," she said. "Or feeling inadequate, feeling like, 'How can somebody be so educated? How could somebody have brought themselves up from their own experience and gone to the top--educated herself, fought for rights, civil rights, and equality?' I think that's threatening to a lot of women." As the Free Beacon reports, "[Bernhard] said making that 'sacrifice' harms women and their ability to be validated through their own work. She said some women who supported Trump do work, but they can still have a degree of inadequacy." "I'm not saying none of these women work, of course they do, but there's just those little gradations in how you look at other women and the sort of feeling of inadequacy," she said.